The United States Mint has increased the premiums for its bullion American Silver Eagle coins from $1.50 to $2.00. The U.S. Mint told its authorized purchasers on Thursday, as first reported on sister site SilverCoinsToday.com by Tarek Saab of Trusted Bullion, an Ohio-based precious metals company specializing in gold and silver bullion coins and bars. The 50 cent increase officially kicked in today, October 1, 2010, and comes at a time when silver prices have been consistently setting new 30-year highs. The metal rallied in September 12.3 percent and completed the third quarter with an even higher gain of 16.6 percent. New York silver closed Friday at another fresh 30-year high, jumping 23.9 cents to $22.06 an ounce. Unlike numismatic coins which the U.S. Mint sells directly to the public, the Mint’s range of bullion products are made available only through a network of authorized purchasers with a goal to provide investors a "convenient and cost effective way to add a small amount of physical platinum, gold, or silver to their investment portfolios." 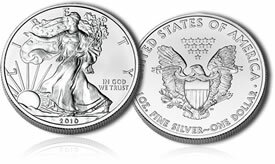 Authorized dealers must purchase Silver Eagles in quantities of at least 25,000. They pay for the silver spot content, plus the Mint’s per coin premium. American Silver Eagle demand has been enormous this year. 325,000 were sold on Friday alone, bringing their year-to-date sales total to over 25,805,500. 2009 became a record year for the coins when 28,766,500 were sold. The last time Silver Eagle premiums were raised was February 9, 2009. Then prices increased 10 cents, rising from $1.40 to $1.50. OR…Is silver actually indicating the $ is deflated by .6% in September alone? OR…Is silver actually being applied more in new technologies and prices are up now as a result?